Philips Advance Centium High frequency electronic fluorescent ballast has durable metal N construction and instant start type. It is voltage rated at 120 to 277-Volts AC, power rated at 85 to 86-Watts, current rated at 0.31 to 0.71-Amp, temperature rated at 70 deg C and frequency rated at 50/60-Hz. It features parallel lamp connection circuitry and an automatic restart. 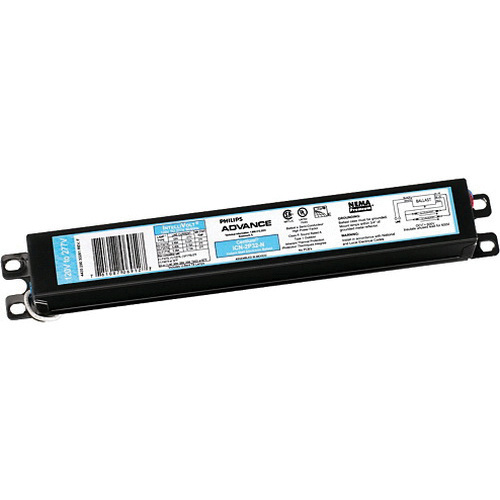 This ballast supports two or three 32-Watt F32T8 fluorescent lamps that provide wide range of lumen output. It has 1.7 crest factor and 0.5 mm/0.375 mm of wire strip. The electronic fluorescent ballast meets UL, CSA, CEC, NOM, RoHS and FCC Non-consumer, CEE and NEMA Premium ANSI C82.11 standards.